For certain readers from certain areas that may or may not start with ‘C’ this may or may not offend. Some attributes of a proper lady, judging by what Julie encouraged in her daughters: they were comfortable travelling alone throughout the US and with appropriate escorts in Europe, they were well-read, multilingual (Latin, French, and German at least), they could manage the household, ride a horse, drive a horse, make clothing, do fine embroidery, read music, hold up their end of a conversation, garden, could draw passibly and had elegant handwriting, and could shoot. It is that last thing, of course, that in the current climate will no doubt appall some of my readers. Yet, Helen carried a handgun much of the time and needed it once to fend off a robbery on the road to Hartford, Lucy in the next generation generally had a handgun in her purse, and if I recall correctly Helen Adelaide once backed her husband up with rifle in hand in the tense hours of negotiating a potential agricultural strike. Aside from being used on a farm as varmint control and for hunting (the former generally only the men, the latter sometimes by women as well), guns were regarded as potentially useful tools that a proper young lady should know how to use if needed. They were tools that ensured their independence and relative safety and were absolutely nothing unusual that merited concern. 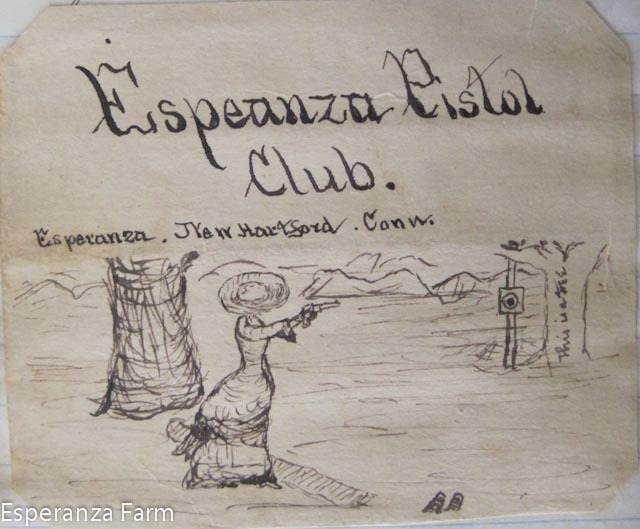 They were also fun tools, as the sketch from the guest book from the summer of 1877 shows. The woman in question was Helen Yale Smith Ellsworth. We know that the guns owned were designed to be carried in a purse or pocket. Given that, given the independent nature of the people in question, and given that there was no particular desire to collect guns; the only reasonable inference that I can draw is that the women of that generation felt that having the ability to carry gave them a level of defense that their mothers and grandmothers lacked. It wasn’t paranoia or politics, I very much doubt either Helen or Lucy were given to such; it was simply part of being a capable woman. Despite its enduring popularity in the novels of that day and today, ‘damsel in distress’ was not approved practice. I’m happy to report that the ability to use tools continues today. *Obviously, there were some dim bulbs, there always are. *By well read think Memorizing the English Canon from Shakespeare on. If you think folks who may, or may not, live in towns whose names begin with M are that quick to be offended, then you haven’t really figured out what get’s their goat 🙂 !